The episcopal sandals, also known as the pontifical sandals, are a Roman Catholic pontifical vestment worn by bishops when celebrating liturgical functions according to the pre–Vatican II rubrics, for example a Tridentine Solemn Pontifical Mass. In shape, the episcopal sandals more closely resemble a pair of loafers than actual sandals. The liturgical stockings (caligae) are worn over the episcopal sandals and cover the episcopal sandals and the ankle. The episcopal sandals and liturgical stockings usually match the liturgical color of the Mass. However, when black vestments are worn, the pontifical footwear is not used. After the Second Vatican Council, the episcopal sandals fell out of common use following the revisions of the liturgy resulting in the Mass of Paul VI, which is now known as the Ordinary Form of the Roman Rite. While still permitted for use in the Ordinary Form of the Mass, they are rarely used in that context. Today, the use of the episcopal sandals is primarily seen in those celebrating the Tridentine Mass. The episcopal sandals should not be confused with the velvet papal shoes, which were recently reinstated by Pope Benedict XVI. The papal shoes evolved as the outdoor counterpart of the papal slippers, which are similar to the episcopal sandals, except that the papal slippers are worn by the Pope outside liturgical functions and are always red. Swedish episcopal footwear in Strängnäs Cathedral. Unlike the ancient sandals, which consisted merely of soles fastened to the foot by straps, the episcopal sandals are in the form of low shoes, and resemble slippers. The sole is of leather; the upper part, generally ornamented with embroidery, is made at the present day of silk or velvet. No cross is required upon the sandals; at Rome this is an exclusively papal privilege. With the sandals are worn the liturgical stockings, caligæ. The privilege of wearing the sandals and caligæ belongs only to bishops. They may be worn by abbots and other prelates only by special privilege from the pope and only so far as this privilege grants. The pontifical footwear is used only at Tridentine Pontifical Solemn Mass and at functions performed during the same, such as ordination, but not on other occasions, as, for example, Confirmation, Solemn Vespers, etc. It is therefore in the most exact sense of the word a vestment worn during the Mass. The liturgical color for the day decides the colour of the sandals and stockings; there are, however, no black stockings or sandals, as the bishop does not make use of either of these pontifical footwear at Requiem Masses. Protonotaries "ad instar participantium" used sandals with yellow galloons without embroidery. Sandals and stockings are customary in the Latin Rite, as well as in some Oriental (Orthodox Churches)). For example, in the Syro-Malankara and Syriac Churches, priests do not wear leather or animal product in the altar, they wear the msone. The sandals retained substantially their original form until the tenth century. Then straps were replaced by three or five tongues reaching to the ankle, extensions of the upper leather upon the point of the foot, and these were fastened at ankle by means of a string. In the twelfth century these tongues were gradually shortened; in the thirteenth century, the sandal was a regular shoe with a slit above the foot or on the side to make the putting-on easier. In the sixteenth century there was a return to the earlier form of the sandal; instead of a high shoe it now became once more a low foot-covering, like a slipper, a form which it has retained until the present time. The material of which the pontifical sandals are made was, until the thirteenth century, exclusively leather, at times covered with silk. Since the later Middle Ages, the upper part of the sandals has been made, not of leather, but of silk, velvet, etc. It is not until about 1400, with the exception of entirely isolated earlier examples, that a cross is to be found upon the sandals. The fork-shaped decoration, frequently found on pontifical shoes, especially on those of the thirteenth century, was not a cross, but merely an ornament. Sandals and stockings belong to the liturgical vestments supported by the evidence from the 5th and 6th centuries. Originally the sandals were called campagi and the stockings udones. The shoes were given the name sandalia probably during the eighth to the ninth century, and this name was first applied to them in the north; the designation caligæ for udones came into use in the tenth century, also in the north. As regards the original form and material of the campagi, they were slippers that covered only the tip of the foot and the heel, and must have been fastened to the foot by straps. This slipper was made of black leather. The stockings were, very likely, made of linen, and were white in colour. In the earliest period the campagi and udones were by no means exclusively an episcopal vestment, as they were worn by deacons. Indeed, this foot-covering was not reserved exclusively for the clergy, as they were worn as a mark of distinction by certain persons of rank, and were probably copied from the buskins of the ancient senators. Their use gradually became customary among the higher clergy, especially when these appeared in their full official capacity for the celebration of the Liturgy. During the eighth and ninth centuries also the Roman subdeacons and acolytes wore a distinctive foot-wear, the subtalares, which, however, were simpler than the campagi, and had no straps. The sandals and stockings became a specifically episcopal vestment about the tenth century. 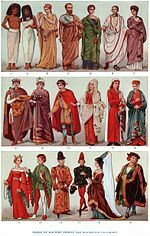 Apparently as early as the twelfth century, or at least in the second half of the thirteenth century, they were no longer worn even by the cardinal deacons of Rome. The privilege of wearing the sandals and caligæ was first granted to an abbot in 757 by Pope Stephen III. This is, however, an isolated case, as it was only after the last quarter of the tenth century, and especially after the twelfth century that it became customary to grant abbots this privilege. The episcopal sandals are no longer normally seen in the Catholic Church, except for those liturgical ceremonies celebrated according to pre-Vatican II rubrics. The liturgical stockings, also known as the caligae, are the stockings worn by bishops over the regular stockings but under the episcopal sandals. They match the liturgical color of the Mass, except when the color is black. The stockings, which are of silk, are either knitted or are made by sewing together pieces of silk fabric that have been cut a suitable shape. The caligae seem to have experienced no particular development. In the later Middle Ages they were, as a rule, made of silk. The earliest enforcement in respect to caligae of the regulations for liturgical colors seems to have been at Rome, but even here probably not until the fourteenth century. Like the episcopal sandals, the use of the liturgical stockings is primarily confined to the pre-Vatican II Tridentine Mass. Wikimedia Commons has media related to Pontifical sandals. ^ Kiraz, Thomas Joseph, George. "Vestments". sor.cua.edu. Retrieved 12 April 2018. This article incorporates text from a publication now in the public domain: Herbermann, Charles, ed. (1913). "Episcopal Sandals" . Catholic Encyclopedia. New York: Robert Appleton. This page was last edited on 30 January 2019, at 04:38 (UTC).